Concept Devices: Conceptus Fabrica Conceptus Fabrica is the third album by Martyn Greenwood under the Concept Devices project, which started a little over 4 years ago. Concept Devices was primarily a live project and Martyn has concentrated more so on this aspect rather than the recording process that generally accompanies a musical journey. 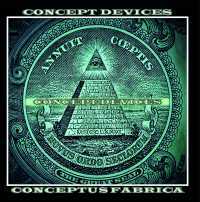 The first album was a one off and never released, Concept Devices II was released as a limited CDr and Bandcamp download which brings us to Conceptus Fabrica. As with all Concept Devices music, this album was recorded using only hardware analogue synths and FX and was realised after a specific purchase of a piece of equipment was made. The sound created by this synth was such, that it inspired the original ideas for the album. This album is an interesting mix of a number of electronic music sub genres, Ambient, Berlin School, Space Music, experimental but also stays firmly within the Concept Devices unique style of melodic music with quirky twists to keep you interested right up to the last note. Folding sequences offering different note priority, real time tempo changes and a specific chosen plan, concept and sound element, move the listener through a complete album of tracks with simple ease. Conceptus Fabrica contains 6 pieces of music, specifically inspired by the intrigue and mystery surrounding the ancient Illuminate order and Martyn has tried to capture that intrigue within the compositions. The tracks range in length and dynamics. Each track on this album started life as a live improvised piece and then slightly embellished with extra motifs and manually synced sequences to create the finished product. Artwork was designed and created by Martyn to compliment the nature of the material and a taster demo track “All Seeing Eye” was made available as a prelude to the full album. Conceptus Fabrica is a “work in progress” and will be ready when its ready, hopefully it will be worth the wait and something to be enjoyed, it is however in its final stages with all tracks being finalised during March 2019.